When I started teaching it was just about OK to say things like that. Nowadays people look at you as if you are crazy. Once I taught a boy, let's call him 'A'. He moved to the school where I was teaching from another one nearby and I met his previous teacher. 'Poor Andrew,' she said. 'He's just not very bright, I'm afraid.' On his first day he said: 'I don't have much luck, Mr May. My dad left, and then we had to move house and come here. Now my dog's died.' Then he settled down to make a model with cardboard and a roll of sellotape. 'A' needed space and time and serenity and calm. I'm not sure he would get them today, because he would need to progress through his levels and sub-levels on a termly and half-termly basis. 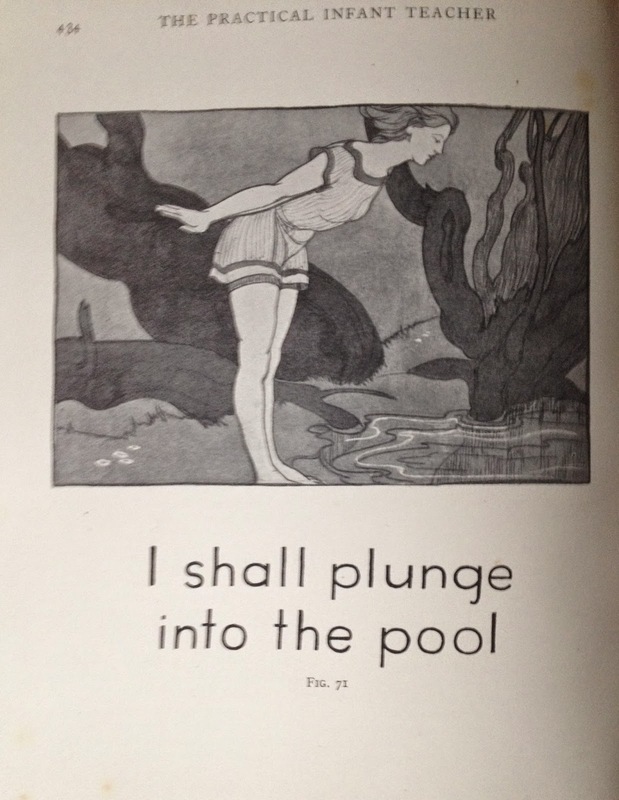 The picture is from 'The Practical Infant Teacher' (1929) It's an example of a sentence to be used in 'the sentence method' of teaching children to read. I am fond of the sentence method. It is closely related to the 'look and say' method, which is how I learned to read. More of this another time!